Purposeful Homemaking: I Have Time for a Good Deal. Do You? I Have Time for a Good Deal. Do You? Okay, so maybe you're not a reader. Or, if you like to read, you just don't have much time for it these days. I can relate. But, even if I don't have time for a lot of reading, I do have time for a good deal so I wanted to make sure you didn't skim over the ebook bundle part of the sale and assume you wouldn't benefit from it. Because I'm guessing you probably can. As I mentioned, as a contributing author, I got all of the ebooks for free ahead of time. I know, pretty cool huh? I just love the little blessings God sends my way. But, even though I got them for free, I still purchased a bundle. Why? Because of the crazy awesome bonuses that come along with the ebook purchase! 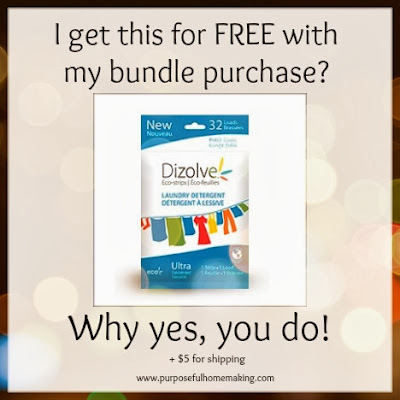 For starters, I want the FREE 128-load Twin-Pack of eco-friendly Dizolve Natural Laundry Detergent ($25.98 value). (If you want this deal you have to hurry because it's only for the first 5,000 customers). I am also a huge fan of Trilight Health so I definitely want to take advantage of their $15 store credit. Plus, I've always wanted to try making Sour Dough Bread, but have just never gotten around to doing it. Now I can with my FREE sourdough starter (OR kombucha starter PLUS $5 credit) from Cultures for Health (up to $17.95 value) and I ordered some amazing tea! I love it so much I used my $5 credit to get some more with my bundle purchase yesterday. PLUS, there are more bonuses that you can take advantage of. There are even more bonuses but those are the ones I have my eye on. If I were to purchase just those 3 bonuses it would cost me around $60. But with my $29.97 purchase I get those, plus other bonuses for FREE. Even if I never read a single ebook it'd be like paying for the bonus items I mentioned at half off. Sounds good if you ask me! Want to get a bundle with me?